Online shoe and clothing retailer Zappos has been at the cutting edge of innovation since its beginnings in 1999. Zappos has never been a brick-and-mortar business. Early on, the company recognized that the world was becoming increasingly digital and capitalized on that by focusing on e-commerce customers exclusively. Through the years, the company has been able to leverage e-commerce, social media platforms, cutting-edge technology, a unique company culture, and excellent customer service to sell its products in a way that mirrors the ever-evolving lifestyles of consumers. It isn’t just that Zappos was an early adopter of social media — it's how the company used social media from the beginning that helped the brand stand out. The CEO of Zappos, Tony Hsieh, was a pioneer in the area of CEOs using social media to gather customer feedback and broadcast the company’s commitment to customer service at a time when most other companies weren't doing that. When other companies were using Facebook, Twitter, and YouTube for promotion, Zappos was using these social media platforms to gather comments from customers and employees and do “word-of-mouth” marketing. Hsieh also encourages his employees to actively participate on social media platforms to share their experiences about working at Zappos. The employee posts are personal, which in turn encourages Zappos customers to share equally personal posts about their experiences as customers. Customers tweet their delight about being Zappos buyers, and employees tweet or blog about their life at Zappos, inside and outside of the company. The way that the company uses social media is truly social and transparent, and the dialogue is engaging and relevant. Zappos has seen so much success that it's now teaching other companies how to operate in a similar way with a digital and "customer first" culture. 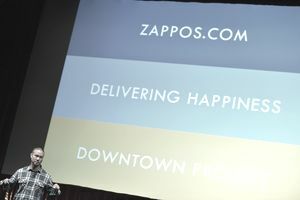 In 2009, the company created Zappos Insights, a team within Zappos.com, to do just this. Much like the Disney Institute and other successful companies’ approach to branding their own company culture as an educational forum, Zappos Insights is for companies and entrepreneurs that want to learn how to successfully attract and retain customers through excellent service. The company offers customer service training for leaders and front-line staff, a three-day Culture Camp at the Zappos Campus in Las Vegas, and keynote speakers. Here is Tony Hsieh speaking about customer service and how he has created a culture around this top priority to make Zappos the successful company that it is today. Zappos, its culture and its leadership can be seen as models for companies that are in the midst of a transformation and are struggling with how to cement a visionary, enduring culture that can be embraced by employees, customers, and vendors. Competitor Amazon acquired Zappos in 2009 in a move to expand the brand even further, but Zappos pledged to keep the same company culture and leadership. The move was successful, and by 2010, the company had grown so much that it needed to restructure itself into 10 different companies in order to maintain the same level of customer service that it had been delivering. These companies operated separately but remained under the Zappos umbrella. Zappos has kept its promise to maintain its company culture. In an move to further empower employees and encourage innovation, the company adaped a Holacracy model in 2013. This way of structuring an organization gets rid of the top-down leadership approach and instead distributes power throughout the company to create more of a flat structure. Although the company admits that this change brought some difficulties along with it, Zappos leadership also says the company ended up stronger for it.